My life has just got a little easier… Why? Well because of a lovely thing called a drip irrigation system. Does anyone else not like hand watering their plants/gardens? If so, this is perfect for you. 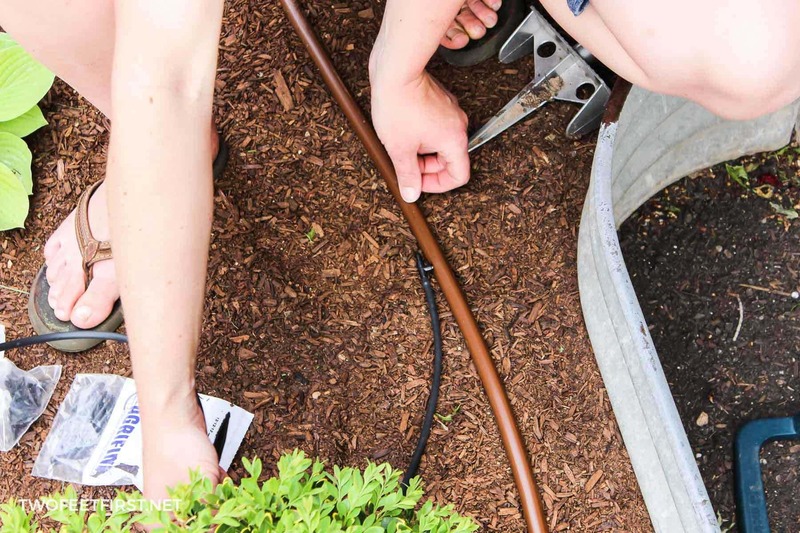 See how you can build your own drip irrigation sytem. 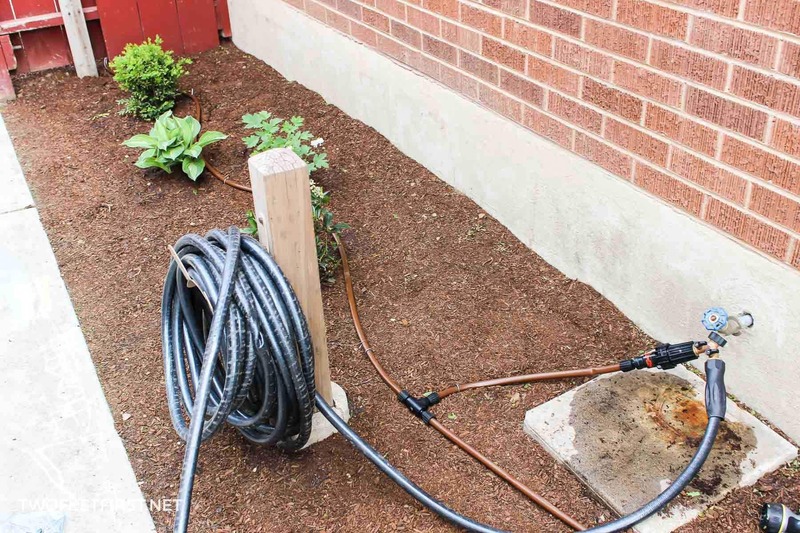 If you missed my first post about the details on the materials needed for a drip irrigation system, you can check it out here. Disclosure: Some of the links below are affiliate link for your convenience, meaning at no additional cost to you, I will earn a commission if you click through and make a purchase, click here to read our full disclosure policy. Find the list of tools we use. Now the first thing you need to do is map out your garden area. Take a tape measure and measure the distance of the area. This distance will be the amount of 1/2″ tubing you need to buy. I purchased 100 ft of 1/2″ tubing and I had a little leftover. I would also suggest 50 ft of 1/4″ tubing per 100 ft of 1/2″ tubing. 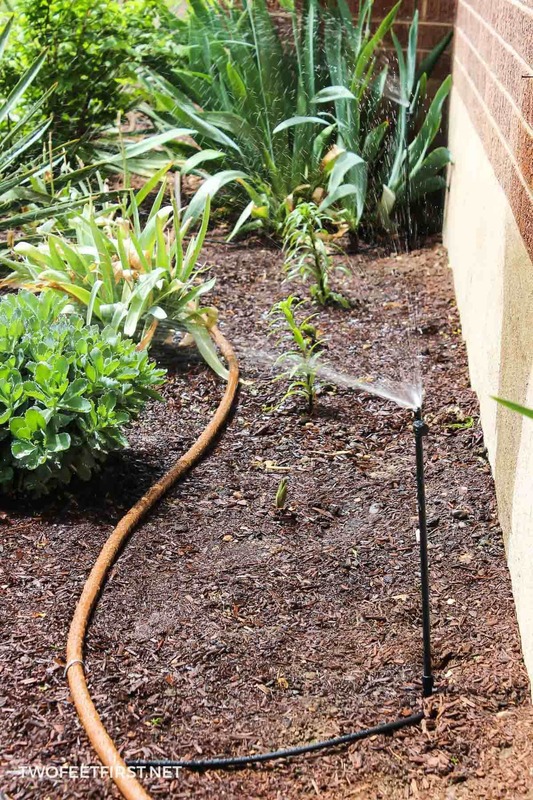 Next, you need to decide the best watering device for each plant or area. Then determine the flow rate for that device. If you can’t remember the different devices check out the emitters on this post. I did two different types of emitters: Drippers & Sprayers. I put drippers on all the bigger individual plants and sprayers on all the areas with flowers. After you have purchased your supplies, you can start installing your system. 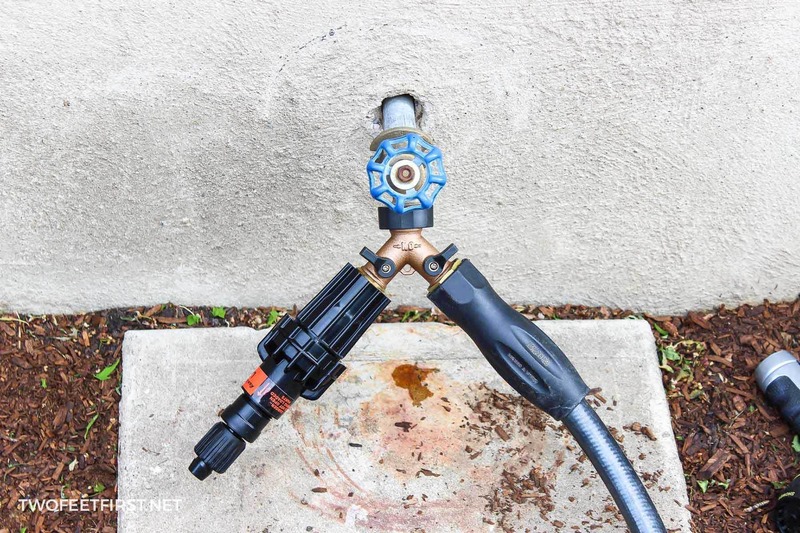 Starting at the faucet, attach the “Y” connector then the timer (if using), backflow, filter, pressure regulator, and hose fitting. TIP: The backflow and filter are only needed if attaching system to the main line (that is what my local sprinkler store told me). Next, you will lay your 1/2″ tubing according to your sketch. 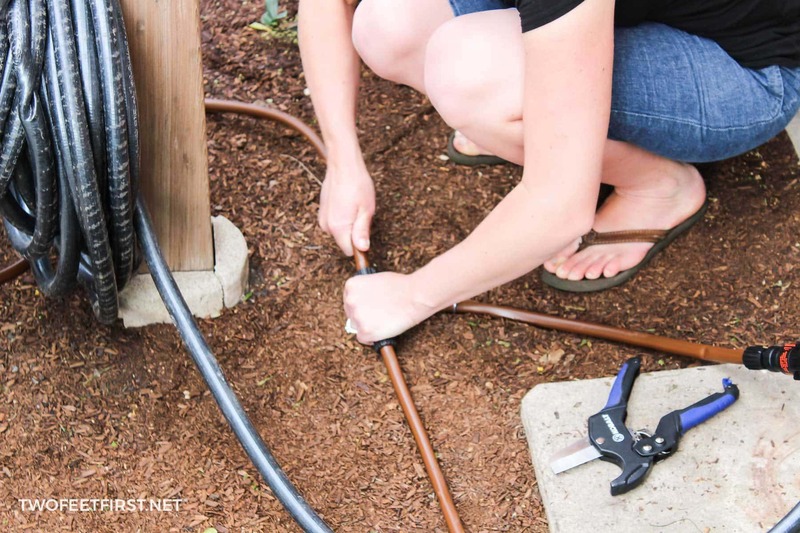 TIP: Place your tubing in the sun before laying to make it more flexible and easier to work with. 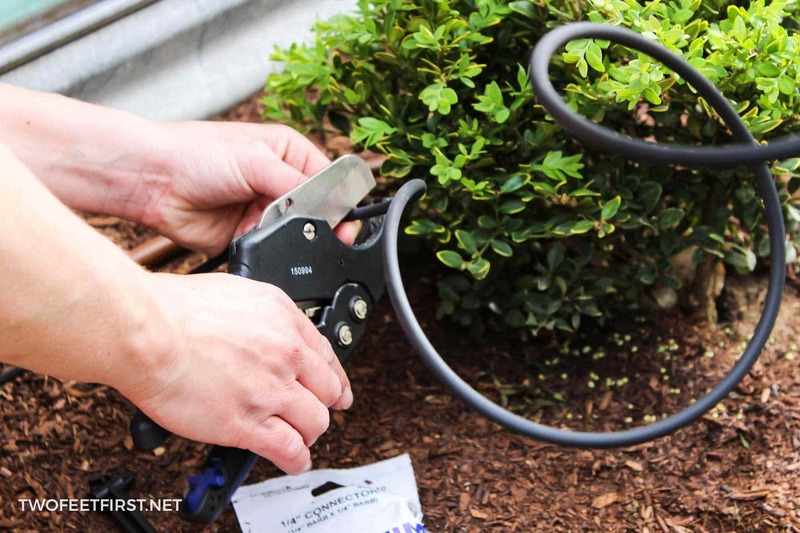 Cut the tubing with pipe cutters/pruning shears. Use tee fittings to create branches in the tubing, see pictures below for how I used a tee fitting. Attaching 1/2″ tubing to the tee. 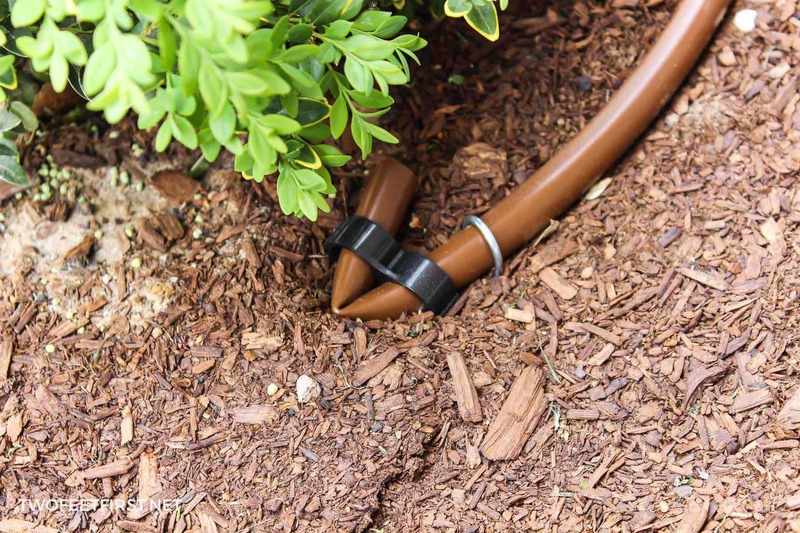 As you are placing your 1/2″ tubing, make sure you are using your loop stakes to anchor tubing to the soil. I only bought a pack of 10 and had to go buy another pack because I did not have enough. 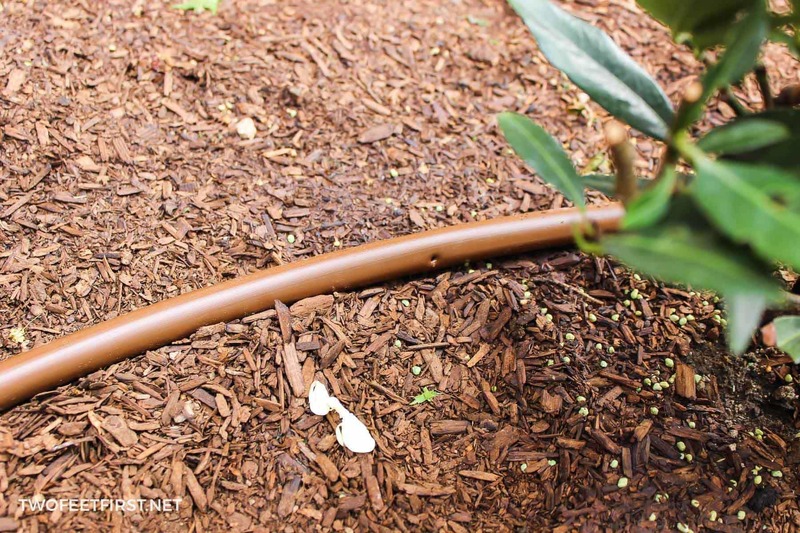 You can also cover the tubing with mulch later on to hide it. 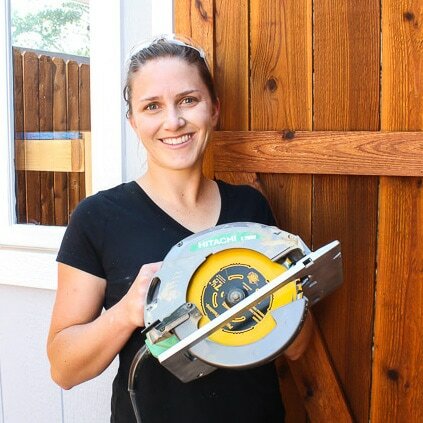 At the ends of the 1/2″ tubing, you need to add an end fitting (figure eight). Now it’s time for attaching the 1/4″ tubing to the 1/2″ tubing. 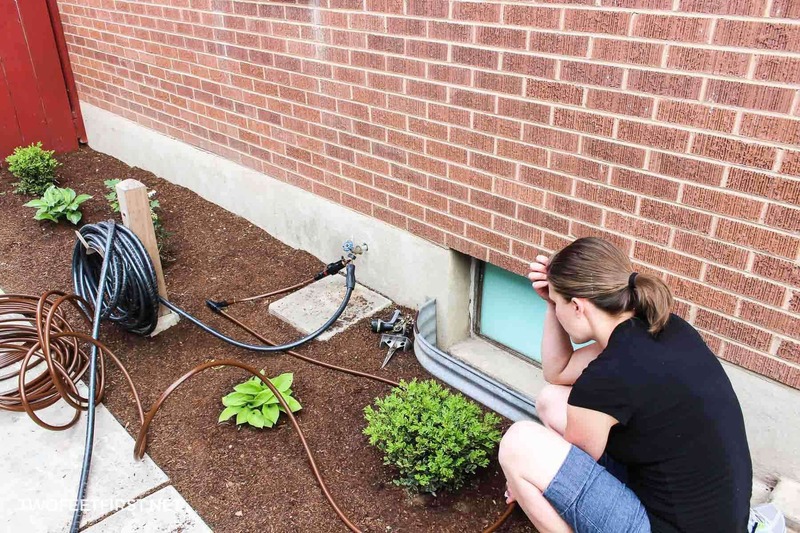 Taking your hole punching device, punch a hole into the 1/2″ tubing wherever you want to add a watering device/emitters. If you do make a mistake you can use a goof plug to fix. Push a barded adapter (I used a tee bared in the picture below) into the hole that you just punched. Then attach the 1/4″ tubing by pushing it onto the adapter. 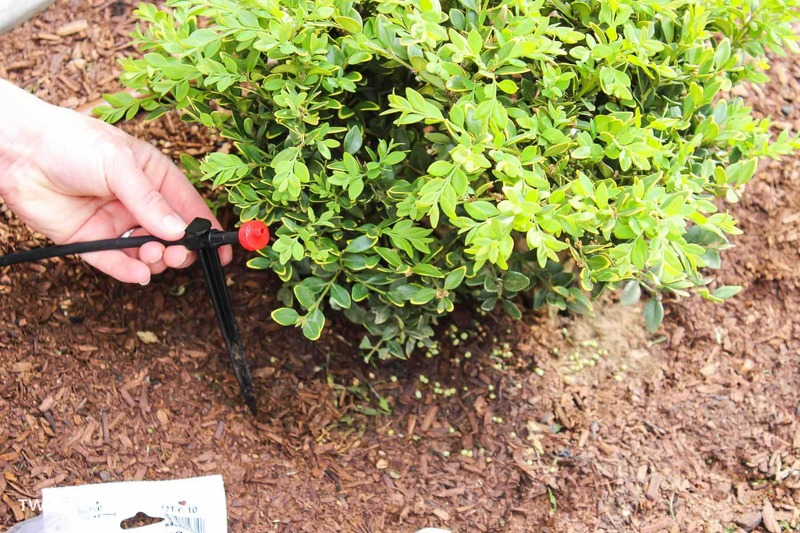 Take the 1/4″ tubing and straighten the tubing until it reaches the plant’s root base then cut at that length. 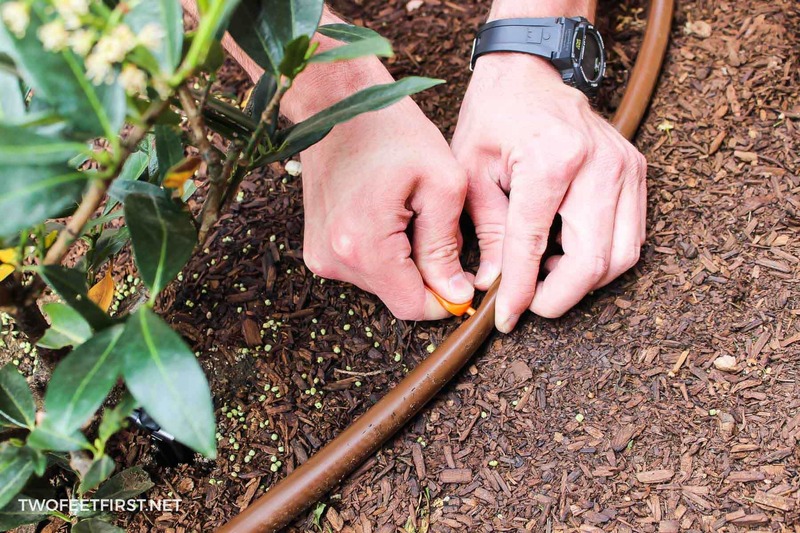 TIP: I would suggest adding a little extra tubing (1/4″ – 1/2″) to the length just to make sure it reaches the plant. 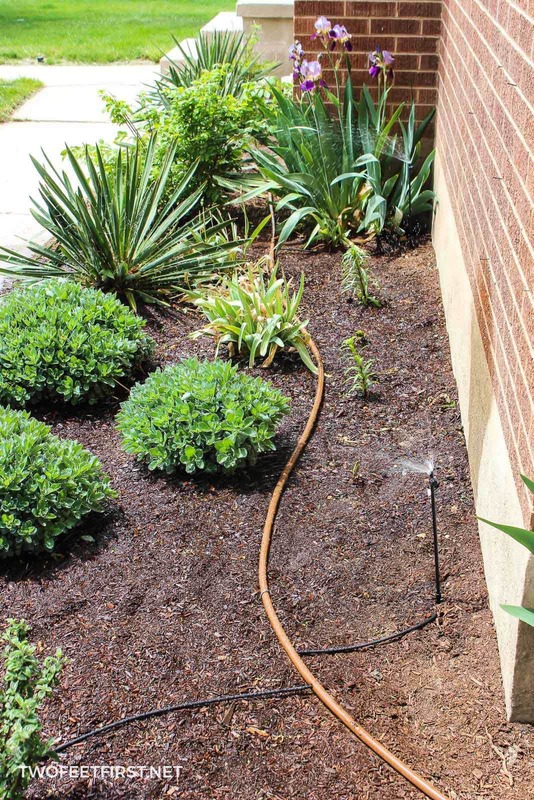 Before adding the emitters to the system, run water through the tubing to flush out any dirt. After you have flushed out the line you can now attach the emitters. For my system, I needed to add the tubing stake before the emitter. You use a tubing stake to keep the emitter out of the dirt. 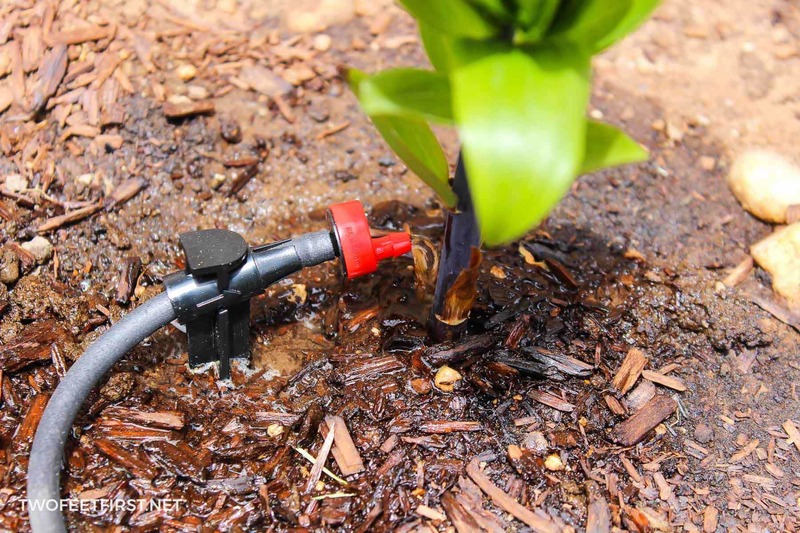 Then place the emitter at the base of the plant so the dripper will water the plant’s roots. 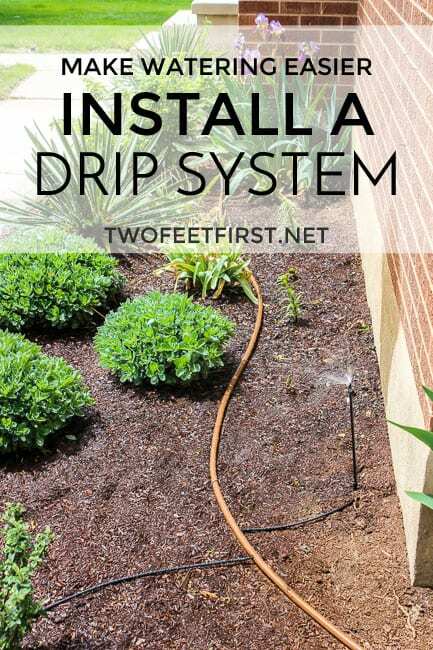 After you have attached all your emitter, your drip system is complete. Run your system and see if you need to add another emitter. If so it is really easy to do, I had to do this. Clean the filter once a month, if using one. Inspect the drippers occasionally to make sure they’re working. In cold climates, make sure you winterize the system, find that here. Anyone else adding a drip irrigation system or want to?